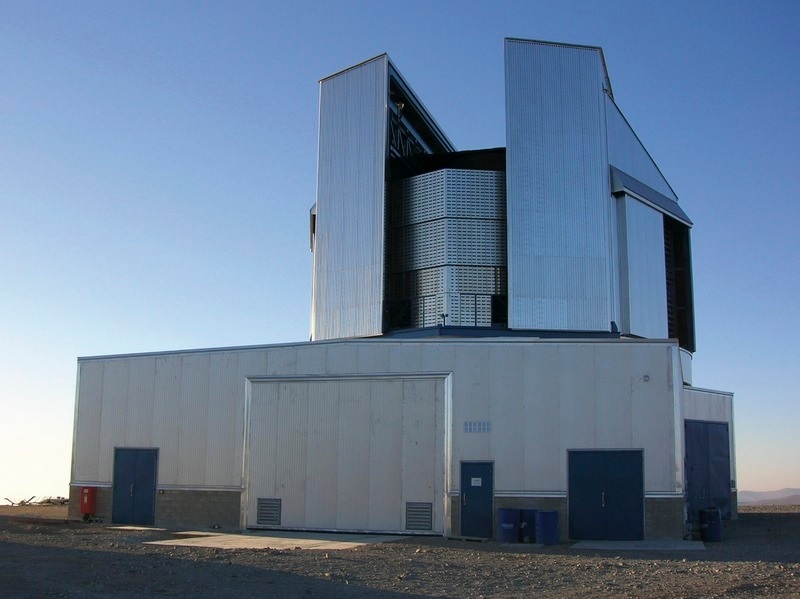 An international collaboration of astronomers, led by a group at the Swiss Federal Institute of Technology (ETH) in Zurich, Switzerland, has used the unrivalled observing power of MUSE on the Very Large Telescope (VLT) at ESO’s Paranal Observatory to study gas around distant active galaxies, less than two billion years after the Big Bang. These active galaxies, called quasars, contain supermassive black holes in their centres, which consume stars, gas, and other material at an extremely high rate. This, in turn, causes the galaxy centre to emit huge amounts of radiation, making quasars the most luminous and active objects in the Universe. The original goal of the study was to analyse the gaseous components of the Universe on the largest scales; a structure sometimes referred to as the cosmic web, in which quasars form bright nodes . The gaseous components of this web are normally extremely difficult to detect, so the illuminated halos of gas surrounding the quasars deliver an almost unique opportunity to study the gas within this large-scale cosmic structure. This research was presented in the paper Ubiquitous giant Lyα nebulae around the brightest quasars at z ~ 3.5 revealed with MUSE, to appear in The Astrophysical Journal. Actually, they’re not completely hollow—matter in voids still manages to coalesce into dwarf galaxies on occasion. This fact presents astronomers with a unique opportunity to view uninterrupted galactic birth and development. “Galaxy formation and evolution is a messy process,” says Kathryn Kreckel, a researcher at the Max Planck Institute for Astronomy. “Voids provide a uniquely calm environment in which to disentangle the effects of some of the many processes that can play a role.” Galaxies in clusters tend to absorb dwarf galaxies, strip gasses from their environment and even collide with them, creating gigantic galaxy mashups—the Milky Way, in a galaxy cluster known as the Local Group, is an example. Scientists using the Sloan Digital Sky Survey [SDSS}—which has “created the most detailed three-dimensional maps of the Universe ever made”—have managed to spot a good amount of dwarf galaxies in voids. Last year, for example, astronomers at Drexel University using the Survey examined “the first statistically-significant sample” of them—2,777 in total. They’re usually found to be in a more youthful state of star formation than dwarf galaxies outside of voids, and tend to be bluer. They also produce stars much more quickly than galaxies in clusters. Another year passes. Another 365 planetary spins completed (14.6 million kilometers of combined distance traveled if you live at the Earth’s equator), and another journey of 940 million kilometers around the Sun. Time is marked off for us by a largely predictable, if not tedious, set of cycles. Except, this is by no means all the cosmic traveling we’ve done in the last 31.5 million seconds. For one thing, the solar system is not at rest with respect to its host galaxy. The Sun and its planetary entourage are moving in an orbital path within the Milky Way. The generally quoted properties of this motion are that we’re heading around the galactic center at about 220 kilometers a second, but with an additional ‘bobbing’, or sinusoidal, motion perpendicular to this. In other words the solar system is meandering up and down ‘through’ the plane of the galaxy, while making a full circuit roughly every 220 to 250 million years. The solar system’s up and down galactic path has intrigued scientists for a long time because it may have a period of anywhere from about 20 to 60 million years. This period is on a par with various claims for distinctly spaced extinction events on the Earth, or episodes of enhanced comet and asteroid bombardment. But the truth is that – as is so often the case – the jury is still firmly out on whether there’s a connection between our passage through the galactic plane and what has happened here on Earth. In fact we really don’t even know what the precise up and down motion of our solar system has been during the past 4 billion years. The Milky Way is not a simple, smooth, distribution of mass. It has lumps, and there are other stellar objects buzzing around, so we don’t yet have good enough models to pin down our past galactic trajectory with any real accuracy – despite what anyone says. Stepping a little further out in scale; the Milky Way and the Andromeda galaxy are falling towards each other at roughly 110 kilometers a second, from about 2.5 million light years away. So in the past year we’ve got about 3.5 billion kilometers closer to a likely galactic collision in about 4 billion years time. In the meantime, around us, the other 54 or more galaxies of our Local Group have continued to hang together as a gravitationally bound system, resisting the undercurrent of cosmic expansion. But these are all parochial motions, the kind of to-ing and fro-ing that happens in a little village. None of these spins, orbits, circulations, and infalls really get us anywhere in the long term, we’re just stewing in our own gravitational pot. What about our journey across a greater cosmic frame? The snag to evaluating such displacement is that on the biggest scales of an expanding and centerless gulf of spacetime, the concept of absolute motion is not terribly useful. If we’re concerned about measuring progress through the universe, what are we actually moving with respect to? There is one helpful gauge. The universe is filled with radiation, with photons zinging endlessly across space. These come from stars, supernovae, quasars, hot gas cooling down, and many other sources. In particular, at any instant in time, a cubic centimeter of the universe will contain, on average, about 400 cosmic microwave background [CMB] photons moving in effectively random directions. This ocean of ancient photons can serve to as a tool for sensing our motion. The blue and red Doppler-shifts of the microwave radiation allow us to build a sky map reflecting our passage through space. Given that we know the Earth’s motion around the Sun very well, and the Sun’s motion around our Galactic center quite well, and the Milky Way’s motion with respect to the other galaxies of our Local Group with some confidence, we can factor those velocities out and deduce the true drift of our intergalactic neighborhood with respect to the cosmic microwave background. The answer is that our patch of universe, containing the Milky Way, Andromeda, and all the attendant, gravitationally bound galaxies, is moving at about 627 kilometers a second in a direction close to the constellation of Centaurus from our perspective. So in the course of a terrestrial year we make a journey of some 20 billion kilometers ‘through’ the universe. Why is this happening? In a nutshell, it’s because the distribution of matter in the universe is not actually uniform – at least not on scales of up to at least several hundred million light years. We’re surrounded by a vast assortment of further galaxies, galaxy clusters, and superclusters. The direction that our Local Group is moving in is set by the net gravitational pull of all these matter distributions, and that’s somewhat imbalanced – so we’re falling in a direction along the vector sum of all those pulls. The precise details of the matter distribution responsible for this – the large-scale cosmic structures – are still unclear, although regions such as the Shapley Supercluster, containing tens of thousands of galaxies, are involved. Chances are that we’ve not yet surveyed the full distribution of responsible galaxies (and therefore matter). We may need to go some billion light years out to account for all the ‘pull’ that is acting on our local patch. Will we ever reach these regions, embracing the cosmic web of irregularity that surrounds us? No, it seems that we will not at our present velocity. The relentless (and accelerating) expansion of the universe will prevent that encounter, eventually isolating our little island. Indeed, while we can measure that we’ve traversed 20 billion kilometers of the cosmos in the past year, during that same period any place a hundred million light years away will have further receded from us by some 200 billion kilometers. This cosmic indifference to any hopes of progress may leave us feeling a little depressed. After another year, another circuit of the Sun, we’re back in a place very, very similar to the one we left, and that is how it will continue to be. Except, the very fact that our minds have figured all of this out, from the spin of the Earth to our modest traversal of an ocean of cosmic photons, is itself remarkable. Whether or not any other sentient beings exist anywhere else in the entire observable universe, here, for a fleeting moment, we can gaze in awe at the cosmos that has allowed our existence. Another 20 billion kilometers through the universe may represent a certain cosmic futility, but at least it is a journey that belongs to us. See the full articlehttp://blogs.scientificamerican.com/life-unbounded/another-year-another-20-billion-kilometers-through-the-universe/ .